Composed of a keyboard clamp, right- or left-hand mouse tray and wrist rest, this keyboard tray is a must-have for any office. 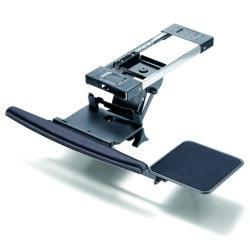 This platform is an excellent ergonomic element for your office or home. I'm very happy with this keyboard tray. My "issue" was a built-in desk whose top is just a tad too high to be ergonomic--I was frequently experiencing shoulder discomfort or numbness in my wrist when working at the computer for more than two hours. I purchased the SPACE ergonomic chair with armrests from Overstock, along with this keyboard tray, and I can honestly say I have never had a more comfortable, ergonomic set-up for working at a computer. Ever. The ONE "issue" I have with this tray is that it does not allow the keyboard to come up past the level to which it is mounted--that is, I would have been happier with a little more range in height adjustment UP, not just down or tilting. The Cotytech is a really nice under-desktop-mounted tray made of solid components. I especially like the wrist pad, which is gel encased in some kind of slippery synthetic covering. Installation took 5 minutes using an electric screwdriver. Screws are provided. Note: while made of quality steel, the unit is a little springy feeling because of its lightweight, slim design, which took me some getting used to. This is compared to absolutely rigid under-desktop systems that I'm familiar with at work. So I'm sure it's just me. All in all, I'm happy with my purchase. The system's great. I liked this product a lot. It installed easily, and works well. Hardware is of a heavy duty design, which it what I was looking for, and should last for many years. "Will the keyboard store completely under a 19" work surface?" "What is the underdesk mounting depth requirement?" Thank you for contactign us deerejohn1386. The underdesk mounting depth will be 17.4 inches. Please let us know if you have any further questions. "What are the dimensions of the mounting bracket space needed under the desk? I have a metal frame that runs the width of the desk that sits 8 inches from the front of the desk. It's in the way of most keyboard tray mounting apparatus. Thanks"
Hello purplelion, we appreciate your inquiry. The mounting bracket is 5.6 inches width x 17.4 inches length (front to back). We hope you have found this information helpful. Thank you for shopping with us. Have a great day!